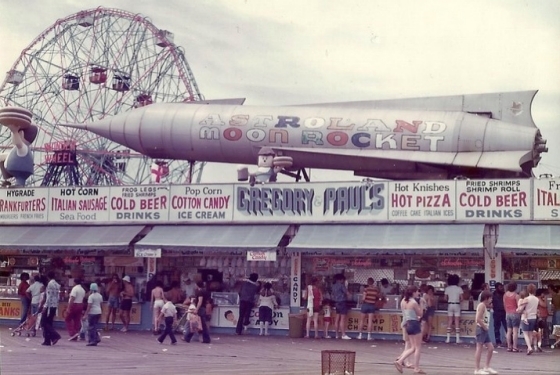 The iconic Coney Island boardwalk concession Paul's Daughter, formerly known as Gregory and Paul's, and in the same family hands since 1962, was forced to close last fall when the boardwalk's new landlord, the Italy-based Zamperla USA, rejected their business plans. You can read the heartbreaking story here. Now that the Paul's Daughter signage is gone, though, you can see that the building has a mercantile history that went beyond 1962. Among the words in the remaining, overlapping painted signage are "Ball" (maybe "Ballroom"), Prizes," "Variety," "Discount" and "Gallery," as well as some other words I can't make out. Layers of history. I'm pretty sure they worked it out with Zamperla. Since part of the deal is to update and renovate they may be planning a paint job. This is good news! Though I don't know why they have to update the signage. It was perfect.